1. Blanch tiger prawns in boiling water for 2 minutes; then remove from boiling water, and keep cool for some time. Peel prawns, but leave head and tail and set aside. 2. Cut ripe mango into small cubes, then combine with green bell pepper, red bell pepper, lemon juice, salt, pepper and olive oil. Set aside. 3. 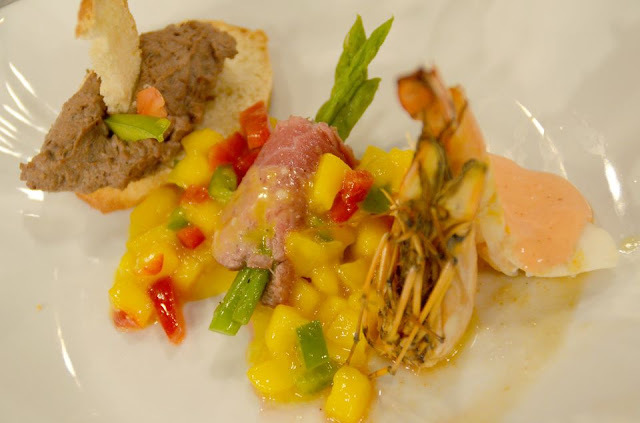 Have ready a shoot glass bed with mango salsa. Top with unshelled prawns, then spoon over prawns with mixture of catsup, mayonnaise and hot sauce (cocktail sauce).